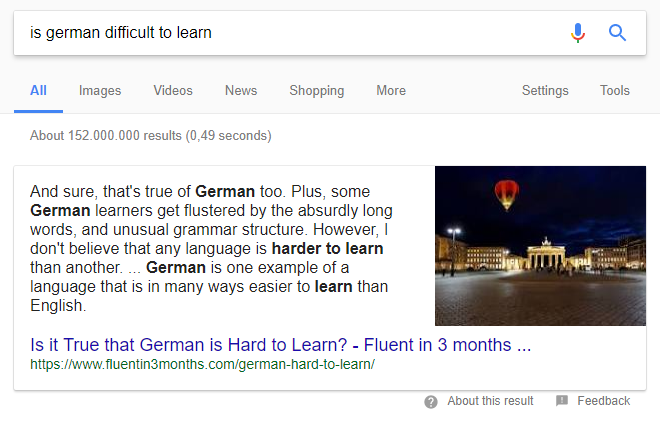 In this article, I explain why it’s so important to get with the trend of featured snippets, best practices into achieving them, and some nice case studies from our efforts on Sixt’s domains. It’s common knowledge in 2017 that search engine result pages are quickly evolving past the archaic format of 10 blue links, and rightly so. Users these days have high expectations; they demand quality, reliable results and want their needs served at first glance. Google’s response to this demand is the growing prominence of Featured Snippets: big, in-your-face organic results that aim to quickly answer your question. Having your website achieve these Featured Snippets can be a jackpot in terms of traffic, conversions and brand awareness, so ignoring their existence can be costly. Before I delve into some insights for winning these magical SERP features, it’s important to highlight the difference between Featured Snippets, Rich Snippets, and Google Knowledge Cards, which can be easy to confuse. 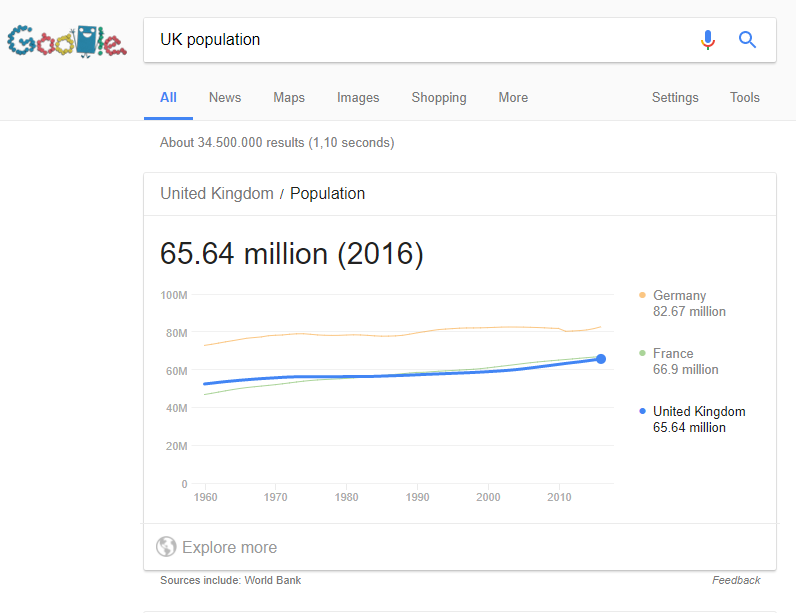 Google’s own Knowledge Cards may look like a Featured Snippet, appearing at the very top of the SERPs and providing a direct answer to the user’s question, but there are a few reasons why you shouldn’t be aiming to achieve these. They appear for generic questions that require a factual, quick answer, and they retrieve entity data from Google’s partner sources – just like the Knowledge Graph does. Knowledge Card answers aim to keep the user on the SERPs, and normally don’t provide an attributed URL below, so you should avoid these keywords at all costs. Rich Snippets are the older, more reliable, but less glamorous brother of Featured Snippets. 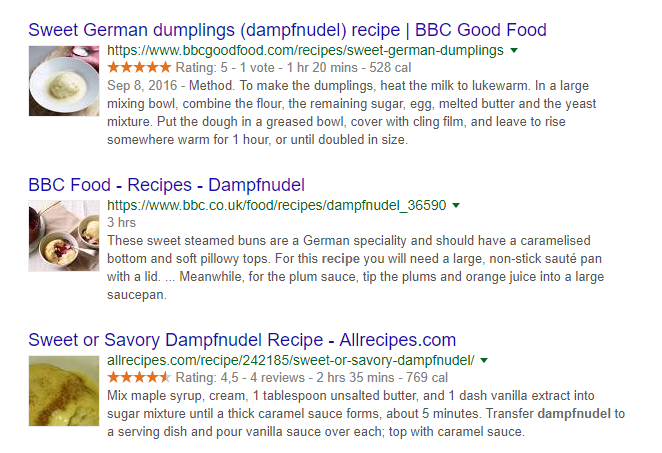 They provide searchers with a quick preview of what lies beneath the URL, displaying content snippets such as rating stars, cooking times, prices and all sorts of fun stuff that you can attribute on your landing page using Schema.org mark-up. Rich Snippet generation is tied to a URL, not a keyword, so there may be more than one per organic result page. Featured Snippets have the prominence and size of a Knowledge Card with the achievability of a Rich Snippet. They appear right at the top of the SERPs in an answer box, including the URL to your landing page. They are, however, relatively rare. Even though Google is continuously increasing the amount of keywords that Featured Snippets show up for, they are still difficult to find, catch and keep for good. But when you do, the rewards can be highly lucrative. 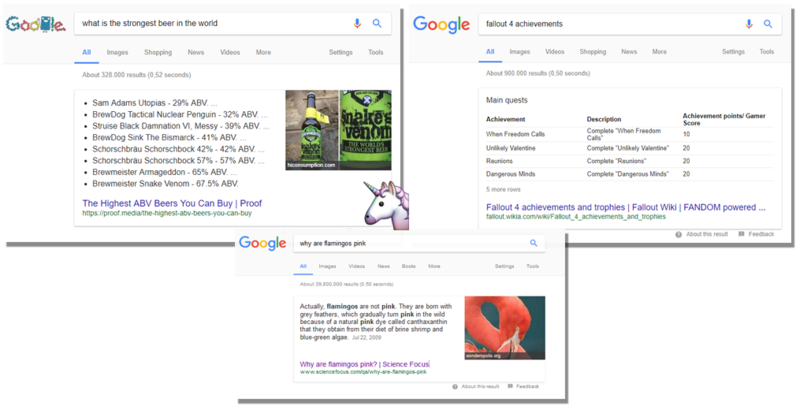 For that reason, Featured Snippets are the unicorns of organic search that are worth spending time hunting for. 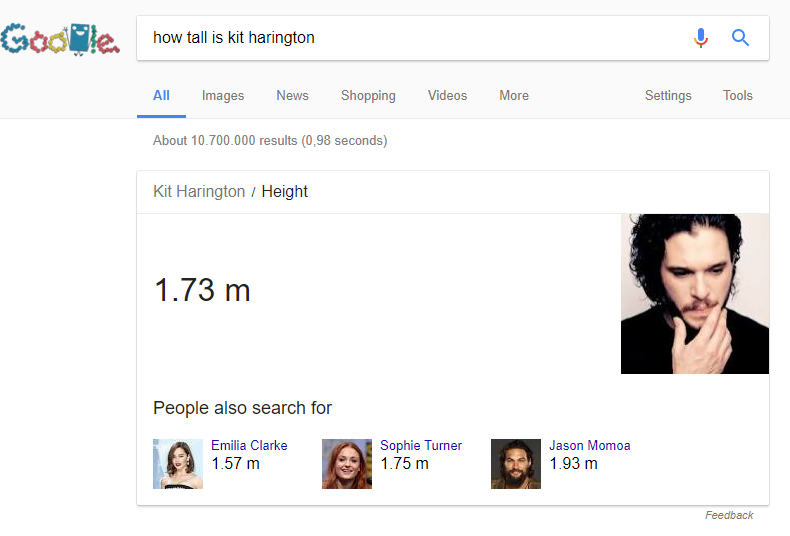 Why Should You Work on Achieving Featured Snippets? Winning a Featured Snippet takes you above the number one ranking (hence why it is nicknamed “Position 0”), thus boosting your CTR and traffic big-time. For this reason, they can be particularly powerful for smaller, younger domains and brands who have a quicker chance to outrank big competitors. Featured Snippets are also growing increasingly important with the rise of Voice Search – if you ask Google Home a question, it will likely respond with the Featured Snippet result. Not only do they have the potential to drive traffic, Featured Snippets are also a good trust signal to the average user. If Google chooses your site as the best answer to the question, it’s likely you will be seen as a reputable, high quality source which will have a positive impact on your conversions further down the line. As well as this, they’re badass and trust me, you’ll be the coolest kid at the party when you start showing them to your friends. 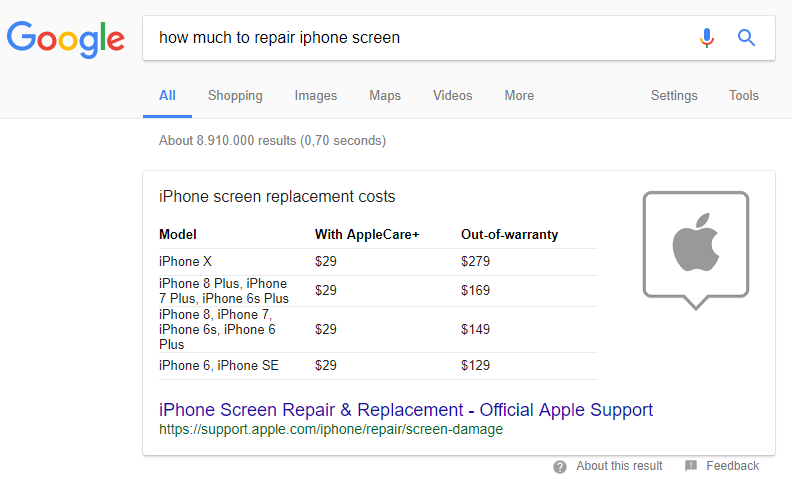 Since experimenting with our SERP appearance across multiple domains, I started generating Featured Snippets not only for keywords that required an answer, but also transactional style keywords. Once this happened, I began hunting for more Snippets, and testing with different variables to see what worked. After two years of investigating, we’ve achieved a pretty sweet method that usually works a treat. In order to begin finding these Unicorns, you need to know what makes them appear. This starts with keyword research and finding what question-related keywords your website already ranks for. You can begin this step by diving into your keyword data on Google Search Console. Although this is rather limited, it’s an important first step and points you in the right direction. One way of doing this is via Google Analytics because of the limited filters available on Google Search Console (you need to have the two connected first). Using common question words as your Regular Expressions and the pipe limiter, you can easily get a good list of questions you’re already generating traffic from. Another way to discover more potential Featured Snippet questions is in Ryte’s Search Success Module. Search Success shows you for which keywords your URLs rank, and for what position. Use it to view which of your URLs rank on page 1 of the search results (positions 1-10) for certain keywords, as these have the potential to be used for featured snippets. Additionally, use the Filter function to discover all your question keywords, and begin the fun process of manually Googling to discover which of those are generating Featured Snippets. Make a note of which keywords are triggering Snippets – it’s easier to steal them than to force new ones. 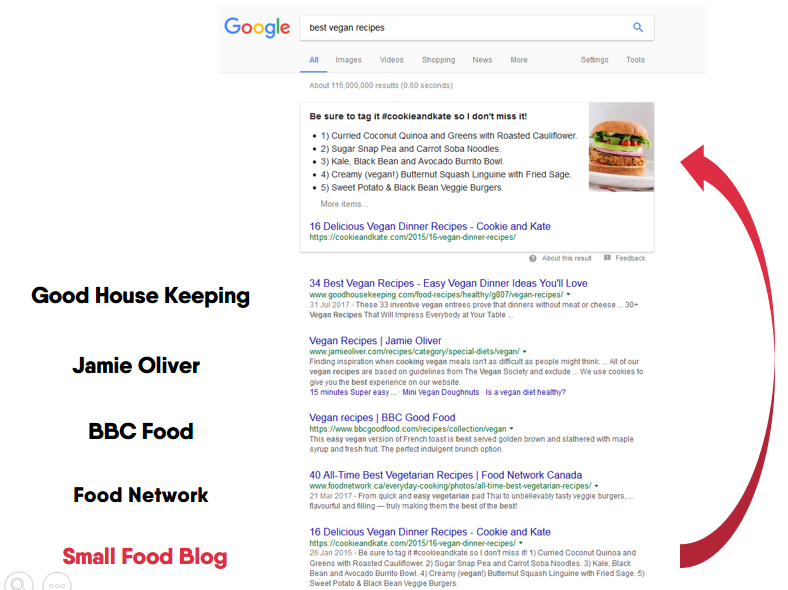 Top tip: pay attention to the PAA (People Also Ask) Box on the SERPs as these usually have a Featured Snippet of their own and can provide worthwhile inspiration. Next, you need to find out what questions your website could answer, but currently isn’t. Featured Snippets aside, this is a pretty important point as it could also mean you’re missing out on many opportunities by not creating the content your potential users want and need. Think about any problem focused around your website or product, set up Hotjar surveys to gain user feedback, use answethepublic.com (a great free tool to discover associated questions with a keyword), browse related forums, speak to your Customer Support and Sales teams – what questions and problems arise? There could be tons of questions out there for which you could be the best source to provide answers for. According to a study by STAT, 60% of all Featured Snippets are displayed as paragraphs, and are triggered by common question types that begin with “Why”, “What”, “Does”, “Can” or “Is”. For these you should simply display the answer in a concise paragraph. According to research by Moz, the sweet spot of these answers is between 40 – 50 words: so aim for that. 29% of Featured Snippets show themselves as lists, either ordered or unordered. These are usually triggered by “How to” and method-related keywords. Target these by adding basic HTML lists. If your method answer requires a lot of additional explanation to each step, simply add headers for each step (like this article!) and Google should be smart enough to build a Snippet List from those. The additional 11% of Snippets are tables, and are more likely to appear for questions containing “Which” or keywords that require comparisons or numerical data. Provide as much data as you can to give a detailed solution to the keyword and use it to build a structured HTML table. From my experience, the more basic the element, the easier it is for Google to grab it and display it on the SERPs. When building your answer, you should place it below a H2 that incorporates the question naturally. Having buzzwords such as “best”, “guide”, “tips” and “how to” in your H1 and introduction paragraph can also have a good impact on generation. Additionally, you should consider your landing page strategy. If you’re lucky, you already have a ranking landing page that simply needs to be optimized. If you’re starting from scratch and have a number of related questions, create a cool FAQs section that strengthens itself as an entity. 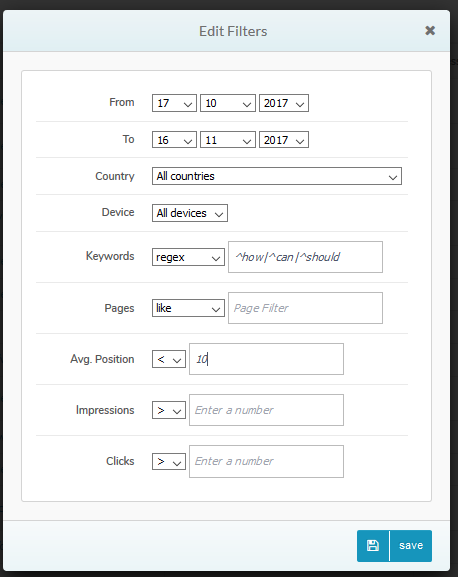 If you’re targeting topics for which you can provide a detailed explanation and have a higher search volume, I would strongly advise creating a separate landing page or blog article with additional engagement elements to generate conversions and valuable user interactions, as well as hopefully that Featured Snippet. When creating your answer content, make sure it’s factual, written for actual humans, solves the problem and hits the user intent perfectly. You don’t have to be a content expert to know how to clearly and concisely provide an answer. As well as answering their question well and concisely, you should aim to strengthen it with related content that is not only of further use for your visitor, but also signals to Google that you are a strong source of knowledge on the topic as a whole. 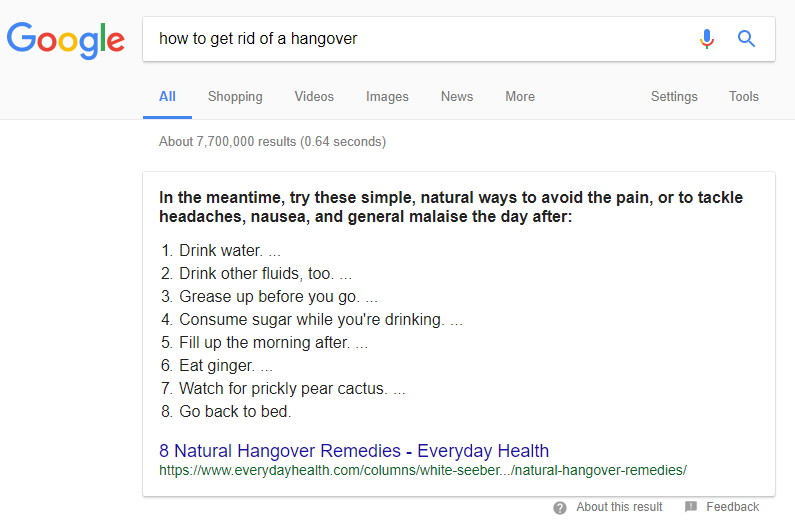 For example, you are creating a landing page for your alcohol website (wish-you-were-beer.com) aiming to win a Featured Snippet for “What are the ingredients of beer?”. You could create a landing with with a concise bullet-point list and call it a day, but your chances of winning that snippet will be increased if you add additional informative content that is relevant to the topic. This could be tips for homebrewing, prices of equipment, the different types of beer and their alcohol levels, and so on. Ryte’s Content Success tool is perfect for this. Schema.org mark-up helps us give more meaning and context to our data, by providing explicit tags for Search Engines to better interpret our content. Structured Data can also lead to the generation of Rich Snippets, which are pretty much guaranteed if you’re targeting a supported Rich Snippet type (e.g. Recipe, Review, Event, Article). According to studies, Schema does not help with Featured Snippet generation. So why bother, right? 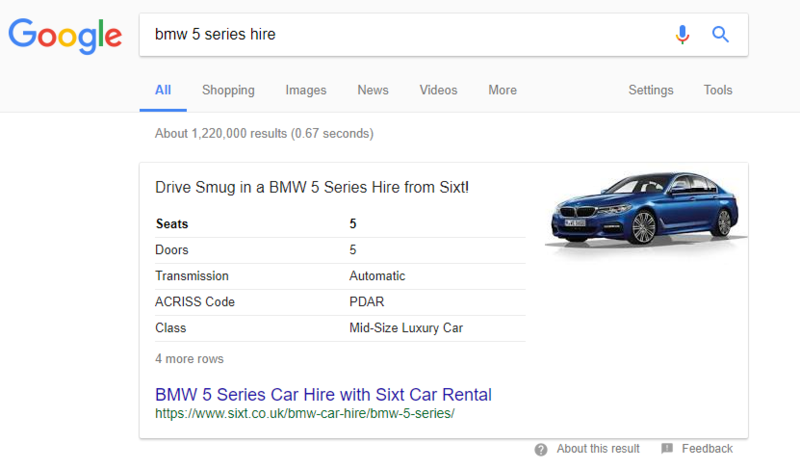 Long before my work hunting Featured Snippets, I tested applying Car Specification Schema mark-up to 50% of our car model landing pages to see if I could force a rich snippet. 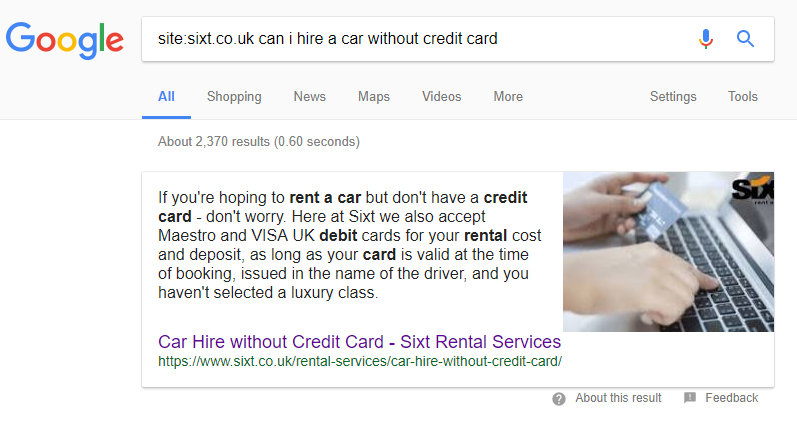 One month later we started seeing Table Featured Snippets for “car model + rental” keywords. However, pages without Schema mark-up are also generating Featured Snippets, but 90% of these “non-Schema Featured Snippets” are displayed as unattractive paragraphs, despite having the tables live on the page. Therefore, I would argue that Schema can help Search Engines understand the context of your answer or data, and also to control what is shown in the Snippet and improve its physical appearance. Whereas the Car Specification tables don’t necessarily provide a solution to a problem, they help highlight our premium car models and take up tons of SERP real estate in our competitive market – generating an uplift of 46% more traffic YoY and +48% more bookings. For our FAQ and Services type pages, I tried Question / Answer Schema just to test any changes to our SERP appearance. After only one week of the Structured Data being live, we actually saw an increase in question keyword snippets as I believe it gave explicit indication to Google that we were providing useful FAQ style content on our landing pages. I would recommend implementing your Schema using JSON-LD rather than Microdata. It’s much easier to apply to nested elements, can be scaled more quickly and it is Google’s preferred format due to its fast-to-parse structure. You should always ensure your landing page is, to state the obvious, generally optimized for search engines: make sure it has strong link equity, is easily crawlable, and provides a good overall user experience. Once you have everything in place, you’ll want to force Google to re-crawl your optimized landing page or level using Search Console’s Fetch and Render tool. Depending on the competitiveness of the keyword you’re targeting, Featured Snippet generation can range from hours to never, but don’t give up on your hunt. If I’m aiming to steal a live Snippet, I usually wait around 4 weeks before returning to my strategy and adjusting. Top tip: Perform a site search with your domain and the keyword. If you see a snippet, you know it’s already being interpreted by Google as a good quality result. Don’t lose CTR by answering the user’s question directly on the SERPs. An important thing to remember is that by answering a question in a concise and clear format, you’re risking losing those clicks if you’ve satisfied the need directly on the SERP. Always give the searcher an incentive to visit your page by padding out your answers when necessary. Google will display a maximum of 8 items for a list, so ensure you provide additional, informative steps to generate that “More items…” tag. For tables, the maximum number of rows is 3 and columns is 9 (but I’ve never seen a featured snippet table that large). Once you start seeing your Featured Snippets generate, you can play around with your results to see what uplifts your CTR even more. 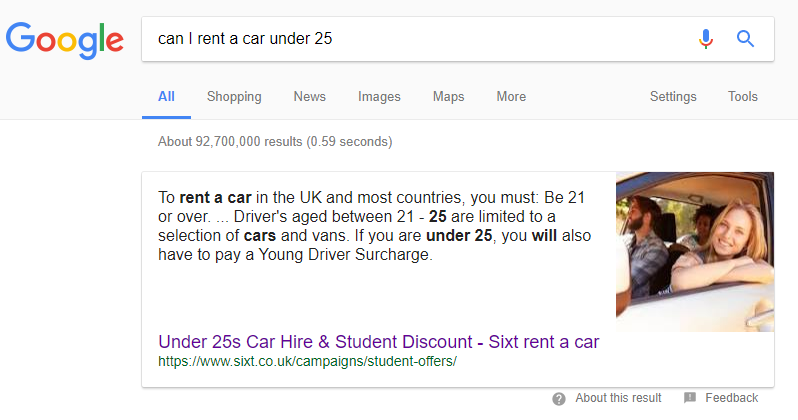 A percentage of Featured Snippets are displayed with images – this usually has a better impact on CTR, but images can sometimes be taken from other websites (with URL! ), so ensure that your images are clearly useful, are compressed and the correct size. In conclusion, I believe that optimizing for Featured Snippets is a necessary on-page SEO strategy because it’s the right step in the direction of creating website content that real humans want and need. You’re aiming to provide high quality answers that serve a need, solve a problem and are easily understandable by both humans and machines. If you apply this strategy when creating or optimizing content in general, you won’t even need to actively hunt those Unicorns – they’ll come looking for you. Published on 11/27/2017 by Isobel Smith. Izzi Smith is the SEO Manager for Sixt UK and has lived in Munich for 3 years since moving from her home town in Manchester, UK. She is passionate about Structured Data, UX and technical SEO. When not optimizing, you can find her exploring the Munich beer gardens and Christmas markets (depending on the season!) or attending local Online Marking meet-ups.